I checked into Second Life, and I can already tell I’m hooked. I’m still trying to figure out basic things like how do I IM someone who’s not there and how do I link prims together. It’s really fun though. I went to a dance party (Superman was grooving there), participated in a philosophical discussion, and rode a flying horse. So far. The cool thing is when I’m done on Second Life, in Real Life I feel really energized and motivated. It’s so easy to move virtually – you can walk, run, fly or teleport – that it makes me want to go for a real run. The other thing is it’s very easy to meet people. You can start a conversation by chatting openly and then switch over into a private IM channel. 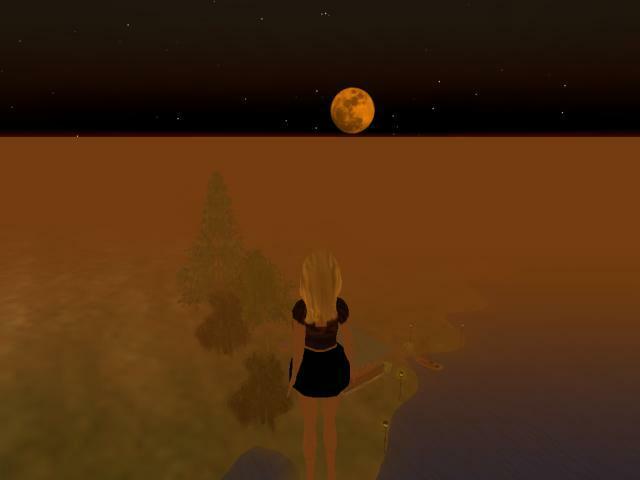 If anyone reads this who is on Second Life and interested in meeting me, my avatar is named Thisbe Streeter. I’m generally online after 6:30pm Eastern Standard Time. See you there! All my life I have heard the line “you deserve nothing but the best.” Well-intentioned as the sentiment was behind the line, as a credo this screwed me over. A friend of mine insists that the word ‘deserve’ implies an action on my part, like “he got what he deserved” implies he did something and the result was fitting. In my experience, the word ‘deserve’ separates action from result. This perception of the word could be because of how it has been used – “nothing but the best” is a very vague statement that lends itself to obscuring the gradations of good – what if I just get ‘better’ for now, or what if ‘alright’ is all I can handle? If I earn something, it’s mine by right of having it as a goal and achieving it. Rather than “nothing but the best,” what I want to earn is a specific achievement. I earn a paycheck la dee da dee dah – but is that good enough? I’m in school, studying theory – fascinating reading material, eighty dollar textbooks. What this blog is about is aspirin – oh wait, aspiring to be more than you already are, but also being realistic. I have limits and I have dreams – but what do I deserve from people on paper? That’s the theme of the overall blog, but today I have something in particular to talk about. That would be letting the real me guide my actions. Is there some alternate me that could be making decisions? Kind of – in that random urges tempt me to act impulsively. Good results won’t be consistent, and bad results will have even worse consequences. I was a mentor for a student who had worked hard to get into a career building program, but she let it all go without fighting to stay in it. She had endured mental illness, and part of her issue was the tendency to act compulsively on whims. I don’t know what went on in her mind – not having my crystal ball handy – but my guess is she dropped out of the program because she acted on a whim or thought her original enrollment was on a whim. I deal with compulsion myself, and I’m working to know the difference between my own true inner voice and the passionate yet passing urge. Even when it’s a matter of mental illness, the pills can’t distinguish what’s right for me. Only my mind can – to paraphrase Lex Luthor on Smallville, ” A person isn’t who they were the last time you spoke to them, they’re who they’ve been throughout the whole relationship.” My latest act or speech doesn’t define me; it’s the cumulative effect of patterns of behavior that come to be identified with who I am. Be that a brick in the wall of the local McDonald’s, or the keystone of an arch in a cathedral.